This entry was posted in Asides, Taking action and tagged fish, funny, green, living green, recycling, sustainable, sustainable living, sustanability, up cycling, upcycling by Jean-François. Bookmark the permalink. Great litterbox! And I laud Norman’s water conservation efforts. My kids, however, were not as enthusiastic with the four-legged-animal-approved drinking of the toilet water. But we have minimized our flushing, so I guess that’s a step in the right direction. Your little kiddies (a/k/a/ kitties) are lovely. I guess minimized flushing and toilet water drinking don’t mix – so fair enough. 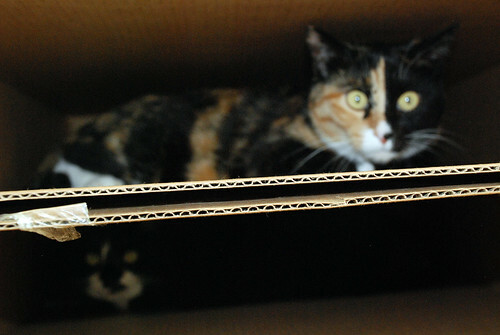 The kitties read the blog, but rarely comment, so I’ll thank you on their behalf. I am rather enchanted by them myself, and by their ability to repurpose just about anything into a toy or fort. Bags and forts are the best for repurposing! I do miss the days when I’d grab my book bag for school, and it’d seem a little heavier…kitty-weight heavier. Glad I could indirectly contribute to your daughter’s classmates’ education. Hopefully they won’t adopt Norman’s water conservation and reuse tips. I enjoyed Norman’s antics. But like your cat, mine love cardboard and find many ways to entertain themselves with a box or two. Thanks. Will pass the compliments along – except to Norman, who is too famous to give me the time of day.